We can sell tickets for your event, activity or tours. We can also do the registration for your workshop, sport event or trade fair. The pricing depends on your needs. Please contact us for a free quotation. Click here for our terms and conditions. Access to real-time information of tickets sales via Webtickets dashboard. Reports include tickets sales, returning customers and customer no shows. Control the details of your event. Control branding and marketing of your tickets. Ticketholder Data: Customise ticket holder data fields for your event. We provide an easy to implement iframe to your web designers allowing you to sell tickets within your site and keep your traffic. Naturally you'll also be listed on the main Webtickets website to maximise your exposure. Include the Webtickets facebook app on your Facebook page - your customers can purchase tickets within facebook. We encourage that customers share after purchasing their tickets. 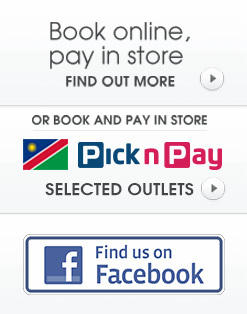 Customers without credit cards can now book online and pay in any Pick n Pay store nationwide. EFT & cash sales accepted online. Custom Confirmation Page - Customise your own payment confirmation page with a special offer, competition link or additional information that you’d only like your purchasing customers to see. Survey Questions - Find out how your customers found out about your event, or which band they’d like to see next by adding a survey question to the payment page. Unique Terms and Conditions - If your event requires unique Terms and Conditions or an Indemnity Form, add a checkbox to the payment page, with a link to your website. Discount Codes - Provide customers with a discount code allowing them to enter this code during the purchase process to qualify for reduced value tickets. Discount ticket allocation - Provide customer with a secure link to purchase discounted tickets only available to that customer. Group Discounts - Offer group discounts by setting a percentage discount after a certain amount of tickets have been selected. 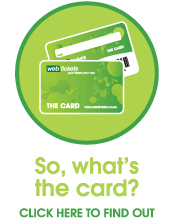 Credit Card Discounts - This allows you to offer discounted tickets only when paid for by certain credit card holders eg Investec/Nedbank/ABSA etc. This is great for bank sponsors of your event. Issue Comps - Issue complimentary tickets directly to your guests, guests receive an SMS/ Email notification to download their tickets. 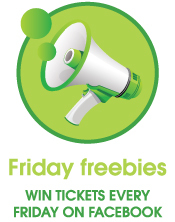 RSVP Comp System - Provide customers with a link to request/RSVP a complimentary ticket. The event organiser can then issue the requested comps via the event manager. Send a link directly to media to apply for tickets to your event. Event organiser is able to view media requests, and accept or decline via the event manager. Successful applicants are automatically notified by sms and email, and issued with media tickets. Customers can preregister for tickets before they go on sale. Event organiser can select which of these customers qualify, and accept or decline via the event manager. Successful applicants are automatically notified by sms and email, and issued with a unique secure link allowing them to purchase the tickets. This is a particularly powerful method of building up hype for an event, as well as monitoring consumer appetite for the upcoming event. Reserved seat booking functionality for stadiums, theatres, fashion shows, concerts, expos and trade fairs. Send us your seating plan and we will map it to Webtickets as per your venue. Allows customers to choose their seat via our user friendly seat mapping system. Eliminate ticket fraud and ticket scalping by allowing customers to transfers their tickets on Webtickets. Our secure ticket transfer function enables customers to sell their tickets to a new purchaser via Webtickets- simply and safely. Date Reschedule - Customers can reschedule thier tickets to another date, for example, The Galileo Open Air Cinema often has to reschedule their shows due to adverse weather conditions, rather than losing the sale and refunding all customers, customers are able to reschedule their own tickets to a new date. Event Reschedule - Customers can easily reschedule their tickets to a different event, for example, the postponed Ben Howard concert, customers were able to easily self-manage the process of rescheduling to the Paolo Nutini concert or select one of the two alternative new concert dates for the Ben Howard Tour.